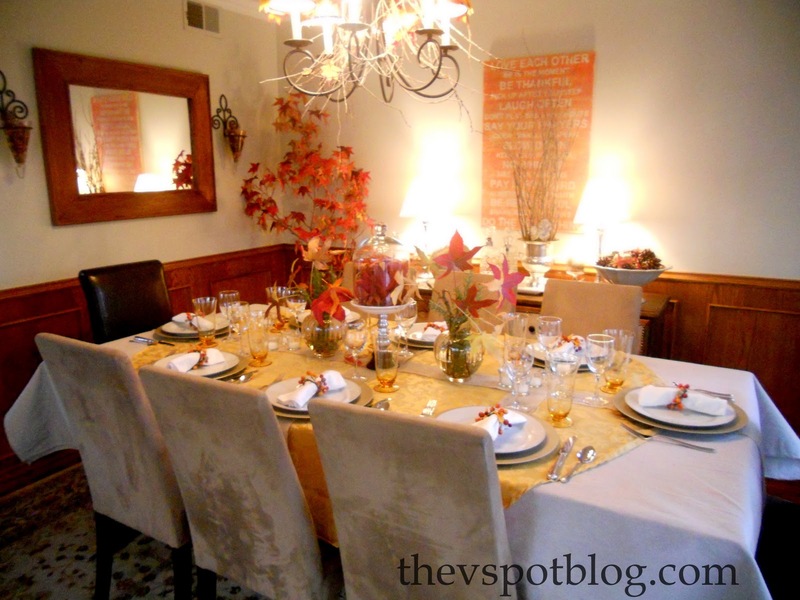 In any event, my visions of an outdoor room, with drop-cloth and burlap walls and surrounded by colorful fall trees and candles will have to wait until next Thanksgiving. (click here to see what I did last year.) This year, all 17 of us squeezed into the house for a sit-down dinner. 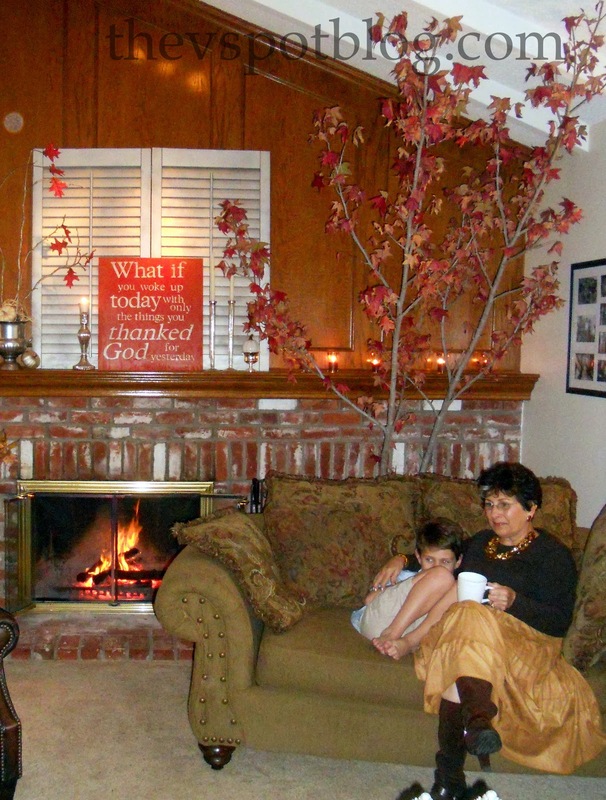 I still did what I could to decorate with all my fall leaves and sticks though. I added them to my dining room chandelier for the evening. I just tucked them into the chain. I just kind of poked the dried leaves into place in between the sticks and they stayed just fine. The shades got a quick burlap and fabric leaf treatment. Because we ended up with everyone inside, we had to shove all of our living room furniture to one end of the room and clear out our entry way. Why? Because I needed a second table for dinner. Yep. See that table far, far away from the dining room table? That was the best we could do, under the circumstances. All of my table decor was either from my mom’s downed tree, or from the landscape guys that I mugged before I knew it was going to rain… In other words: Free. Someone was asking me how I got the fall leaves under the cloche. It seemed obvious to me, but OK. It’s pretty easy. Hope everyone had a fabulous Thanksgiving! I guess it’s better to be safe than sorry. 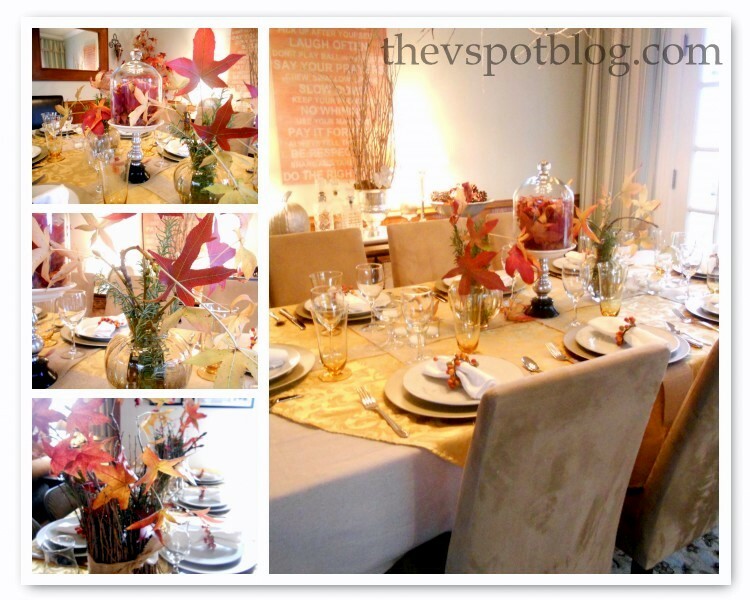 I love how you brought your decorations indoors…you did a really wonderful job…your home & the tables were just lovely! I’m sure everyone had a great time…you are awesome! Sorry about the rain! It looks beautiful inside. Love all the use of the free leaves. I might have trouble getting the leaves into the cloche. I will try the plate trick, but I can see the whole thing going horribly wrong as cloche slips from my hand, plates falls to floor and suddenly two kids run into the room barefooted to see what the noise was. Followed by dog who decides it might be something to eat……. I love seeing what you do with your outdoor entertaining area but this is amazing too! Way to pull it together. And darn it if it didn’t rain! What the??? But it turned out great anyway. You are too much! 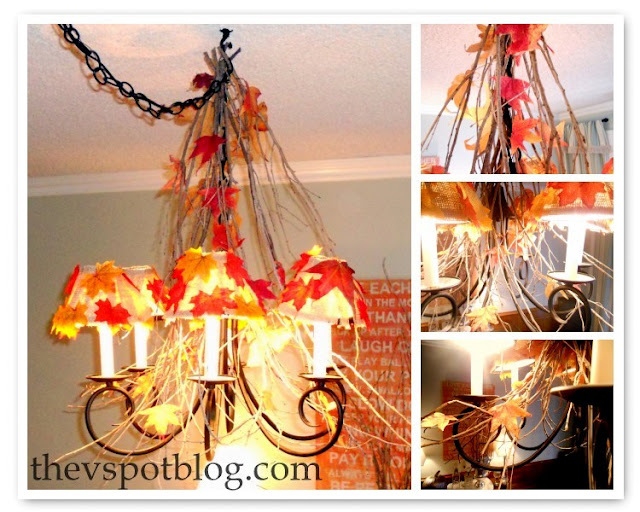 Putting those branches in your living room, LOVE IT:) Your setup looks great and what an amazing trick to get your leaves in your cloche, ha! All that inside effort and it never actually RAINED?? Sheesh. Oh, well, isn’t it good to know that you can in fact have a sit-down dinner for that many folks indoors? Now you have lots of options, it seems to me! And everything looked beautiful and perfectly autumnal. Well done! It looks beautiful, as usual!!! I feel your pain with those temperatures, Brrr is right! Your plans B looks beautiful and I’m sure your friends and family didn’t mind a bit being in the other room, you only sit for the meal anyway. Bahahahahaha! Leaves. In the cloche. How’d ya do it. HAHAHA. Okay, whatever. Anyway, it looked beautiful inside! And. 62 is cold? Better pack some sweaters!! Your indoor space looked fabulous!! Oh man. Your set up is absolutely gorgeous. We were in Michigan. Those that couldn’t fit around the table sat on couches, chairs and on the floor. We had 40 people walking around his moms not-so-big house. Ok, seriously, someone needed a tutorial on the leaves? Wait. Was it me? I’m thinking that I could have figured that out though so I’m hoping it wasn’t me. How darling!! Loving what you did with your chandy. And I was feeling all superior about the leaves until I thought about it and decided I probably would’ve had to ponder that for a few.